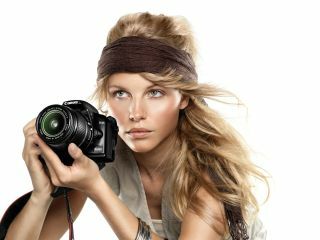 Canon has added to its expansive collection of DSLR cameras, with the new EOS 1000D. Sporting a 10.1MP DIGIC III CMOS sensor, 2.5in LCD screen and a 7-point wide-area autofocus system, the camera is aimed at those looking for a way into the prosumer market without breaking the bank. The cam sports a similar look and feel to the EOS 400D, but at just 450g (body only) it is the lightest camera in the Canon cannon. Some notable changes from the EOS 400D include a change of card memory – from CF to SD – and the addition of Live View, which was also found on the EOS 450D earlier this year. The maximum shots you can take in Burst mode is up from just 27 on the 400D to a whopping 514 – something that’s sure to impress wannabe paps everywhere. Price-wise the camera is even more impressive; weighing in at just £499.99 without a lens. If you want a 18-55mm IS lens kit bundled in, that’ll cost £579.99. Expect to see the Canon EOS 1000D hitting shops in July, just in time for a bit of holiday picture-taking.